This post is sponsored by Target. All opinions and statements are my own. If you’ve followed our blog for a while, you know we love to mix and match styles. Mixing and matching is always in style and always creates a unique display that represents things you love. 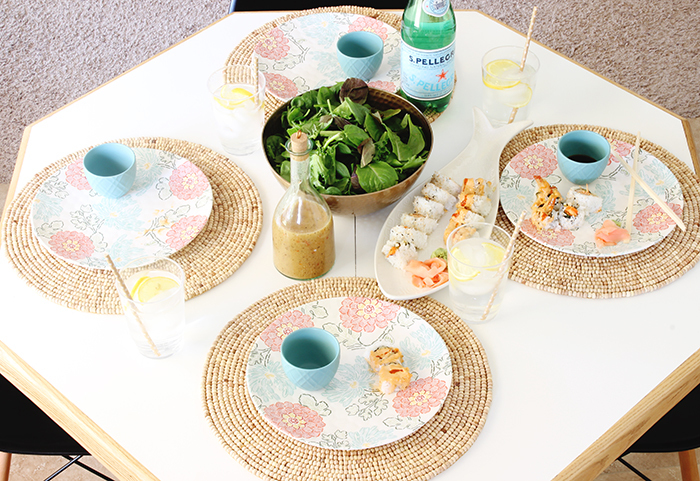 We love the eclectic look that mixing and matching pieces can bring so when Target challenged us to mix and match dinnerware for weekday entertaining, we thought it could be really fun! Target always has a variety of colors, patterns and textures you can mix and match. We mixed metals, ceramics, glass, and even plastic and melamine to create fun texture, color and patterns on our dinner table. 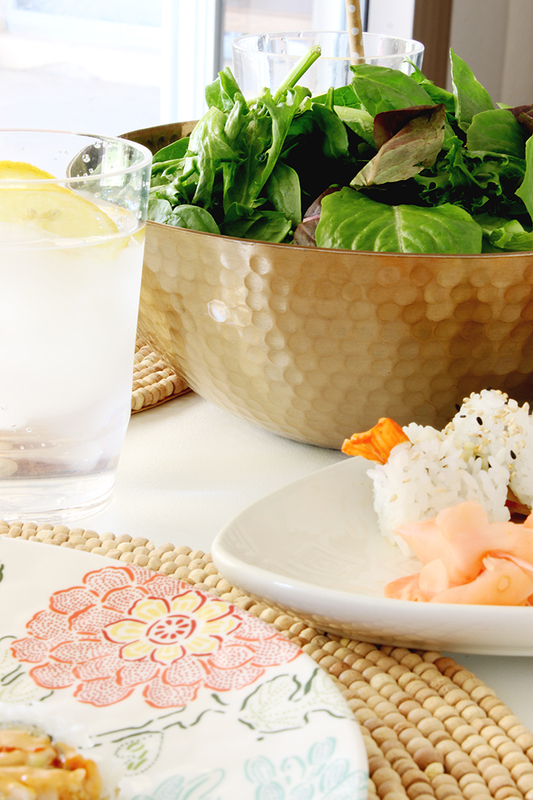 You may have heard, we LOVE sushi. 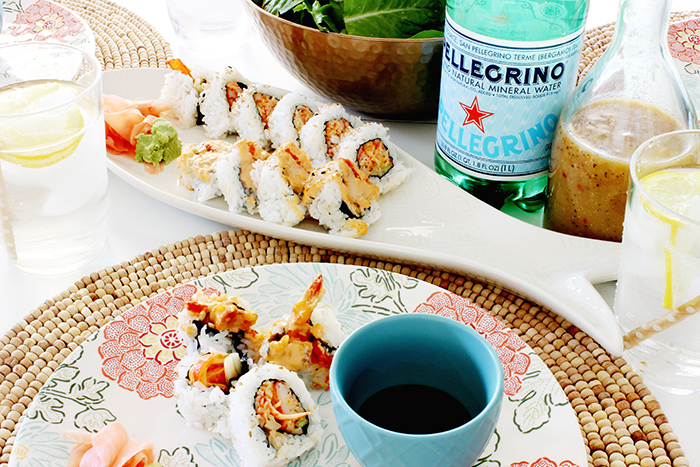 Sushi is one of our go-to eats when we go out so why not bring it home to spice up a boring Monday? 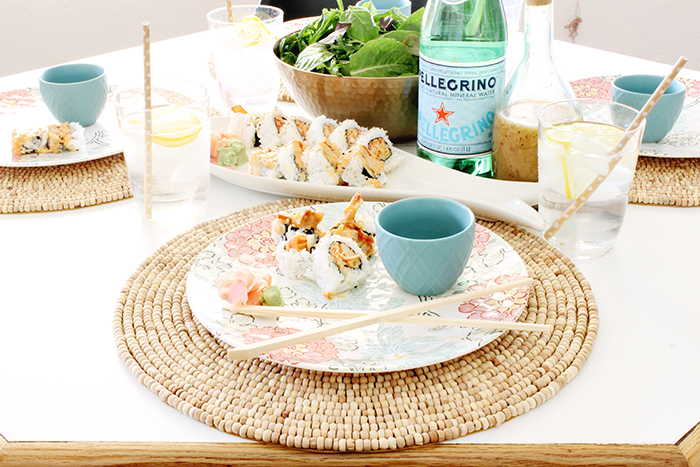 This fish platter from Target is the cutest way to serve sushi! 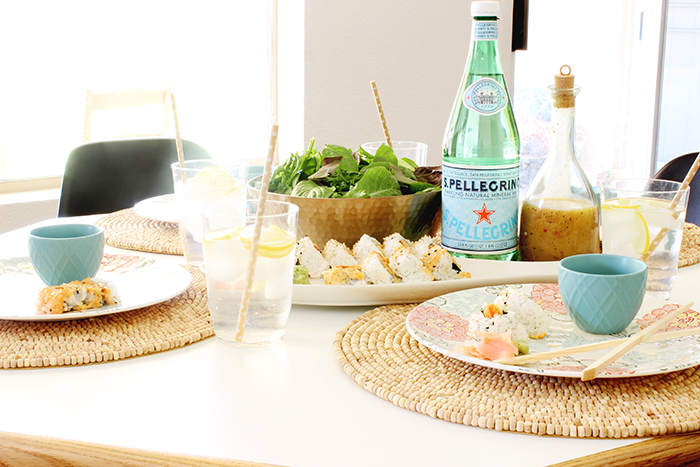 Now that we knew what we wanted to do for dinner, we decided to mix and match a lot of texture on our table. We chose these Threshold Beaded Chargers. (Similar here). We love the texture of the beads and the wood grain color is so pretty! We’re both moms of 3 and 4 kiddos so it was crucial that our dinner table isn’t filled with glass and breakables. While we used a few glass items, most of the items on our table are metal, plastic or melamine (which is a hard plastic as well.) 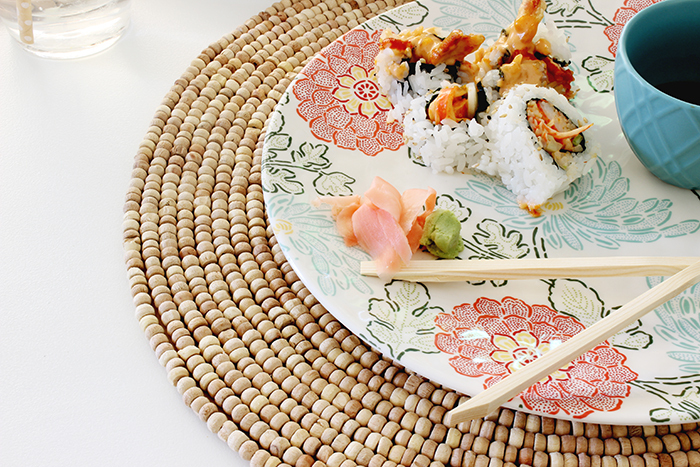 We love these floral plates. Target has so many amazing options for plates. We used the mini bowls for soy sauce. We got the aqua ones. These are dishwasher and microwave safe stoneware so that’s a huge plus! The next item we used was the Threshold Metal Hammered Serving Bowl. We LOVE this piece! There are different sizes that start at $14.99 and it is SO gorgeous. Tip: Use a metal bowl for salads and refrigerate the bowl before serving. It will keep your salad cooler while on the table. For the drinking glasses, well, we didn’t want to use glass so these acrylic tumblers are awesome! They’re amazingly priced and look like nice glassware! Entertaining and dinnertime doesn’t have to be difficult and you can really express yourself in your home by mixing and matching. Dinnertime is family time at our house so make it your own by choosing styles, colors and materials that work for you and your family! Mix and Match YOUR way with #TargetStyle.